In a large stockpot, melt butter over medium high heat. Add chopped onion and sweat until translucent, about 6 minutes. Add potatoes and kielbasa and stir to combine. Add corn, clams and beer and bring to a simmer. Once beer is simmering, add lobsters to pot and cover tightly with a lid. 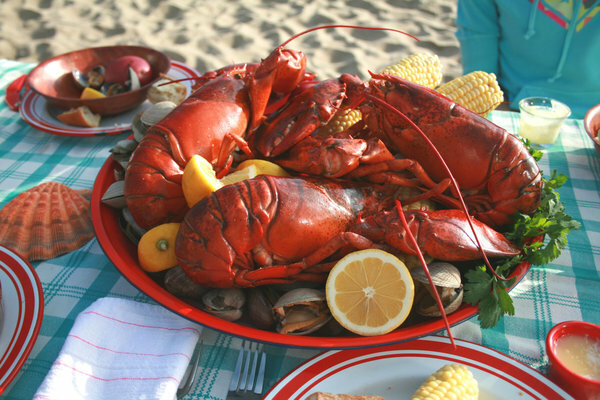 Cook until clams are open and lobster is bright red, about 18 minutes. Remove lobster from pot, crack claw and slice in half. Place potatoes, kielbasa, corn and clams in a large serving dish. Taste cooking liquid and season to taste with salt and pepper. Serve with cornbread, green salad and lemon wedges and drawn butter for dipping.